This MCSP co-authored article published in the journal Studies in Family Planning highlights the challenges of meeting postpartum contraceptive needs in developing countries, where the majority of women deliver at home. Using a quasi-experimental trial design, the authors examined the effect of integrating family planning (FP) with a community-based maternal and newborn health (MNH) program on improving postpartum contraceptive use and reducing short birth intervals <24 months. In this two-arm trial, community health workers provided integrated FP counseling and services during home visits along with their outreach MNH activities in the intervention arm, but provided only MNH services in the control arm. The contraceptive prevalence rate (CPR) in the intervention arm was 15% higher than in the control arm at 12 months, and the difference in CPRs remained statistically significant throughout the 24 months of observation. The short birth interval of less than 24 months was significantly lower in the intervention arm. 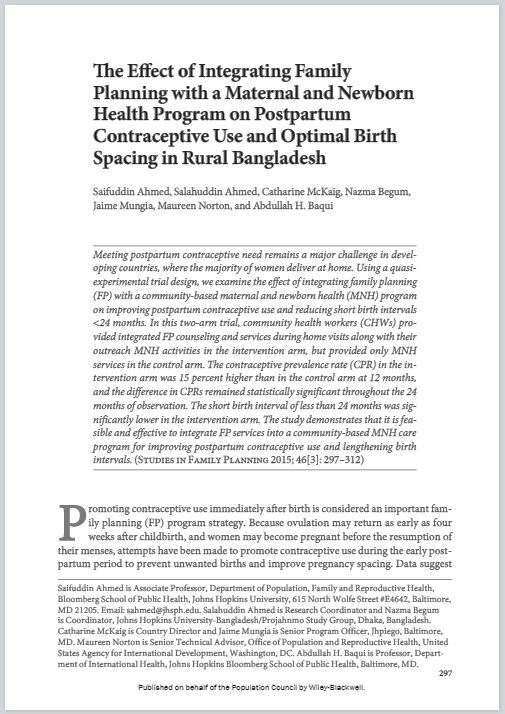 The study demonstrates that it is feasible and effective to integrate FP services into a community-based MNH care program for improving postpartum contraceptive use and lengthening birth intervals. To view the article, which requires a subscription fee, click here.